Being a haphazard gardener means that I don't always know why a particular vegetable has a great year, or why that same vegetable has a poor year. The shallots did splendidly, this year. All of the bulbs are large. Not a single scrawny one in the batch. And I can't say that I know, for certain, why. 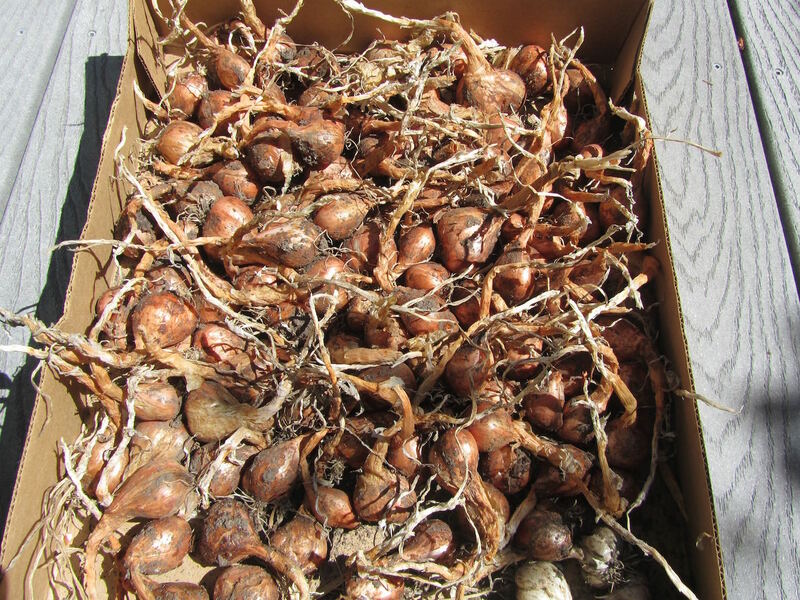 It could be due to fertilizing the soil before planting the bulbs. Or it could be the warm spring we had. But then again, it could also be the wet summer. Maybe they were in a particularly sunny spot. I don't know for sure. But I will be sure to fertilize the soil before planting the garlic next year. I didn't do so for the garlic this year, as I planted those bulbs in autumn, before I had a supply of good fertilizer. If that proves to increase the size of my garlic, then I may be onto something. In any case, I'm quite thrilled for the shallots. I plant a lot of ordinary vegetables, like carrots, lettuce, cabbage and potatoes, each year. Even if I didn't grow those vegetables, I'd still buy them at the market. I grow them because they do so well, and can be counted on each season. 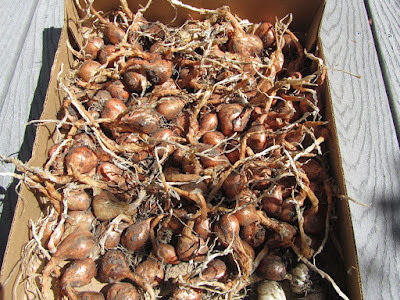 But I also plant a few items that I'd likely not buy, but I enjoy cooking, like the shallots. I love the flavor shallots give to cooking. They're not as pungent as garlic and not as sharp as onions. Shallots are in the just-right zone for flavoring salad dressings, making soups, or sauteeing with mushrooms to spoon over meat. They can be tolerated, raw, without ill effect. Or cooked to caramelized perfection, and melt on the tongue. But shallots can be pricey in the market. So, I'd likely not buy them. Growing these vegetables that I enjoy but wouldn't buy, allows me some luxury in my cooking. And as for growing my own, shallots are quite frugal. I bought the ancestors to these bulbs about 15 or 16 years ago. I just save the very biggest each year, for planting in the next. And there's enough leftover for cooking throughout the winter. Gardening can be so frustrating sometimes because despite your best efforts, the crop doesn't produce. But then you get a year like this year with your shallots and it keeps us trying again. Enjoy your shallots. Absolutely! Thanks, I think we will. yeah, that's kinda key with keeping a garden. Although, I did start growing kale, simply because the seeds were cheap one year (10 cents/packet). We had no idea if we'd like it or not, and this was 20 years ago, before the kale craze. As it turned out, kale does very well in our garden, so I had to find ways to prepare it that we would enjoy. So, in that sense, we are growing the kale because we enjoy it. But it took some tries to make the preparation something we'd like to eat. Thanks, Carol! I think we'll be enjoying these! It feels like fall, here, too. So much cooler than last week. And the light is different. My daughters and I took a walk on Sunday and there were leaves on the ground in some spots (most likely due to dryness, and not frost, but still). I love fall, but I dread what follows -- winter. Wow, what a wonderful harvest. This is such a windfall! A "luxury" item you didn't have to pay a premium price for. Love that! Our harvest this year is going to be very poor. Critters have been stripping our trees and berry bushes this year before anything can even mature. We do a lot to try and protect our fruit and it's still getting stolen away. Excessive heat has stunted the only fruit the critters don't want, too. I guess that the "blessing" here (since I'm always looking for hidden blessings) is that we're really very busy to also be canning, drying, etc. this year. So maybe we're supposed to focus on other things and/or help some elderly neighbors process THEIR fruit for their use, instead. Super-happy for your great harvest year, though! I'm pretty happy they did so well. That's a good attitude, looking for the blessing. And this also lets you see more clearly, just how well you'll be provided for in the coming months. That's wonderful that you can help your elderly neighbors. I'm sure that they are very appreciative! Looks like a good crop to me. Do you hang them for storage? I don't hang them, but store them in a paper bag in the produce drawer of the fridge. They keep all winter that way.